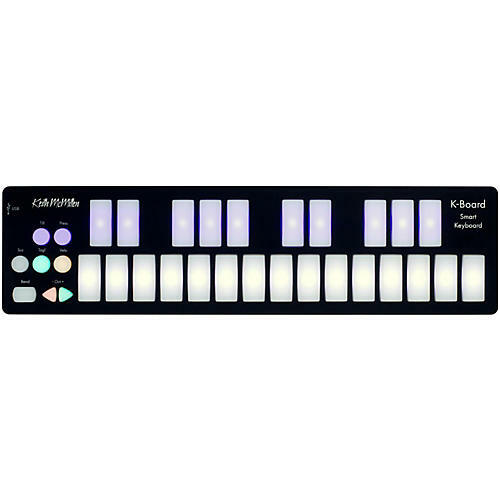 K-Board is an unbreakable, ultraportable USB MIDI keyboard that works out of the box with Garage Band, Ableton Live, or any music application. K-Board has been tested to survive being run over by a car, dropped from a 2-story building, and more -- all without breaking. The LED backlit, touch sensitive keypads ignite creativity and add musical expression by detecting your velocity, pressure, and finger tilt. Just pull K-Board out of your backpack, plug the USB cable into a computer or tablet*, launch any music app, and you're ready to make music at your home, studio, the stage, or on the go. 1. K-Board is bus-powered via the USB port when connected to a computer or tablet. *K-Board defaults to a note range of 48 (C2) to 72 (C4). The octave buttons allow you to shift up another 3 octaves or shift down 2 octaves for a total range of 7 octaves (C0-C7).